The next wellness babe I was lucky enough to chat to is the gorgeous Danijela, also known from her food instagram as @healthyalways. Danijela is a nutritionist based in Auckland and her feed always looks insanely good! 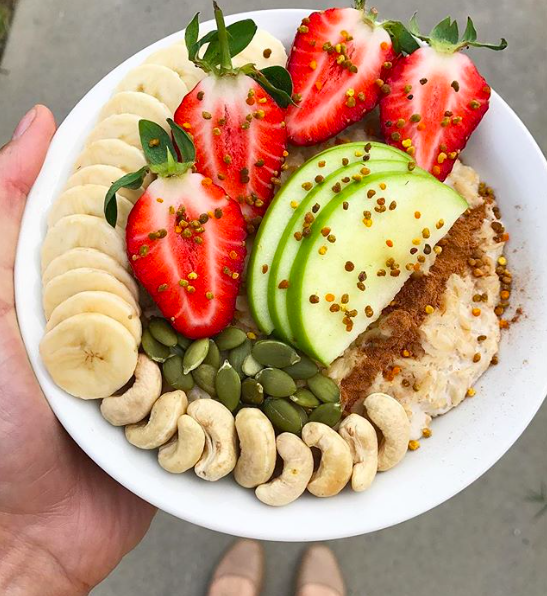 Think smoothie bowls and lots of nourish bowls and platters - yuuumm! I haven't met Danijela (would love to, but haven't hehe), but from the interactions I have had she is very genuine and so lovely! If you need some inspiration or endless delish recipes, nutritional rambles or advice, look no further! I loved reading through these responses, I hope you do too lovelies! My name is Danijela and I'm an Auckland-based nutritionist. I currently divide my working hours between community and clinical work, where I consult, educate, support and assist clients with living healthier lifestyles. I'm a bit of a nutter/passionate about anything health and wellness related, as well as cooking and spending time in the kitchen. I also run the health blog, Healthy Always, which is my space online for nutritional ramblings and healthy recipe ideas. Writing this, I can see I probably need some new hobbies haha. I think it's something to be respected and valued - we get one lovely body, and it does all this neat stuff for us, like keep us alive! But really, I think health is about how we feel - not look (which we often put so much emphasis on! ), but feel. It's about feeling good - whether physically, mentally, emotionally and spirituality. I often start my day with movement - so a quick yoga flow, walk or HIIT session. My working hours are really dependant on where I'm based at for the day, but might include consulting with clients, researching, writing meal plans, or creating health content and recipes. My eves are usually quiet - a yummy dinner and a good book is my idea of a good time! In the morning I usually do something quick and easy like a smoothie. I love smoothies because I feel you can squeeze so much goodness into a glass. I'm a snacker and enjoy munching on things like nuts and fruit (and some sneaky dark chocolate, yum!). Lunch and dinner are typically similar, where I'll have a few handfuls of veggies, a protein (e.g. chicken, fish, beans) and starchy carbohydrate (e.g. rice, kumara, potato) of sort, and then a few servings of fat, like avocado, a drizzle of olive oil or nuts and seeds. I'm lucky to have access to a beautiful organic community garden at work, which I'll often head down to at lunch and forage for something to eat. Our health is built by what we do most of the time, not some of the time. Aim to eat in a way that nourishes your body most of the time, then indulge in other foods that light you up when you feel like it. I really don't like restrictions or putting foods in good or bad piles - I see this a lot in the clinic with clients, and it's detrimental. Give yourself permission to eat what you want. While life is short and we should totally eat the cake, quality of life is also important - so I think striking a happy balance is good. I like the 80-20 rule - 80% of the time aim to eat well, and 20% have a little wriggle room to indulge. I disconnect - technology is great, but it's also overwhelming and mega stimulating. To reconnect, it's good to disconnect. I hang out with my dog, a lot - pets are amazing for our mental health! Exercise - similiar as above. Exercise is just as good for the mind, as it is for the body. Live in the moment - a little cheesy, but so often our mind is jumping all over the place, whether to the past or future, but not the present. With mindfulness our minds become calmer. I love food heaps, but all kinds of foods. It took me a while to learn the importance of balance, and that, while we can still enjoy our favourite treats, consistency is important for building great health. A wonderful doctor once enlightened me to the simple idea that we don't all perceive life the same. What worries me, might not worry another. This really helped me with getting perspective on situations and not being as hard on myself, as I'm naturally quite sensitive and an over-thinker. It's a tie between chocolate and macarons. Suddenly I'm a bottom-less pit when these foods are around haha. Leafy greens, avocados and chocolate. It's always changing, but I love high intensity workouts. I feel alive after them! Do more things that make you happy. Life is fleeting, and one way of bringing deeper meaning into our world is to follow what lights us up - there are deeper reasons as to why they light us up, which we'll only figure out if we chase the lead.